Moore Ranch is a working longhorn cattle ranch located just 45 miles from historic Dodge City, Kansas. 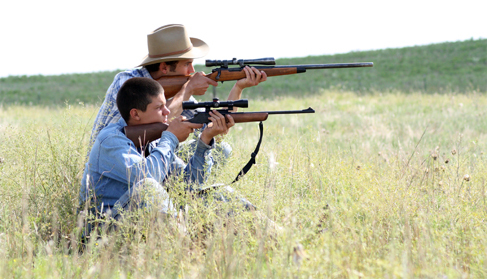 It is a family ranch run by the Joe and Nancy Moore and their son Laramie. 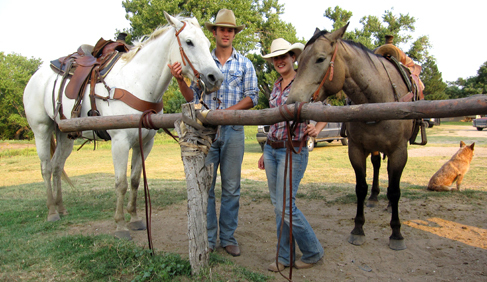 The family shares its daily experiences with visitors to the ranch. 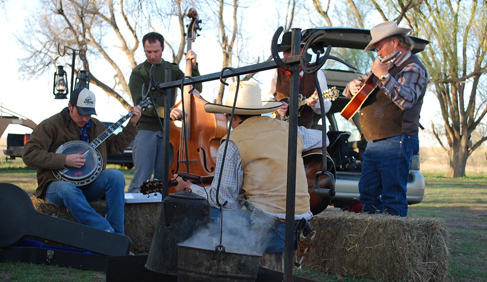 None of the activities of the day are fabricated to mimic the life on the ranch. 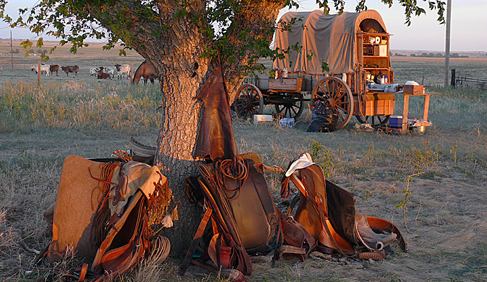 Guests experience a true day in the life of a working cowboy. 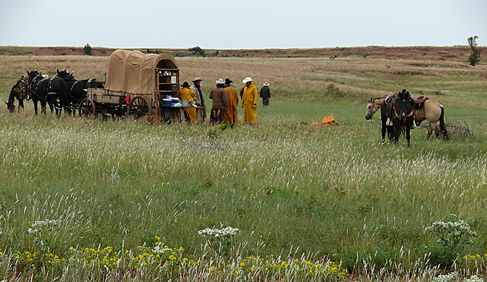 Special events such as cattle drives are limited to 10 guests. All other days there are usually only 1-5 guests. This allows for a genuine experience between guests and the Moore Ranch Family. Guests can participate at any level, from taking photos from the top of a fence to actually saddling horses, gathering cattle or branding calves. Guests may awake at sunrise to the sound of the roosters crowing and join the family in the morning barnyard chores. After a hearty breakfast, guests can help saddle up the horses. 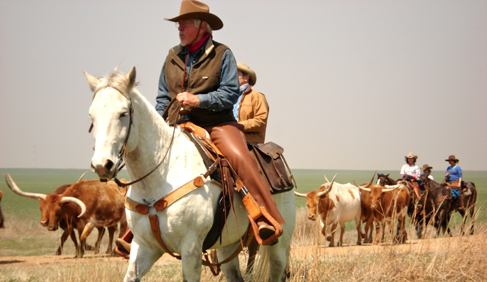 The rest of the day may include riding ranch horses through the Longhorn herd, herding the Longhorns to new pasture, riding over the prairie while monitoring for wildlife, learning to rope a calf, barrel race, sort cattle horseback or even branding the longhorns with a hot branding iron. Evening will bring the supper meal and may include and enjoying the stars, the quiet stillness of the prairie, and lightning bugs from the porch of a cabin. 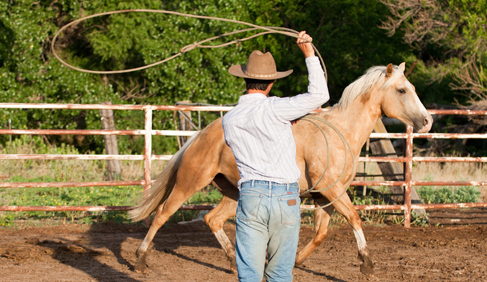 All ranch work is done the old-fashioned way–– by horseback. There is no head-to-tail riding done as the work is done out on the open range. Guests are free to ride out on the prairie and ride freely–– trot, lope, canter or gallop as necessary. Cattle Drives are exciting events. 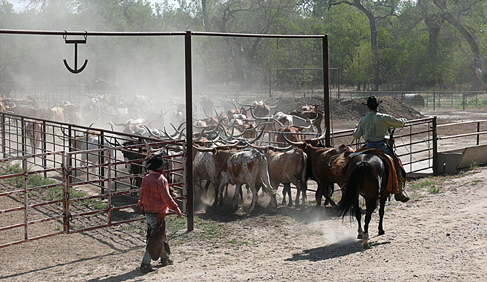 Two day cattle drives are available when moving the Longhorns in the summer time. The herd is trailed 12 miles to new pasture across an open expanse of rolling prairie. The next day, ranch horses are ridden back to the ranch. 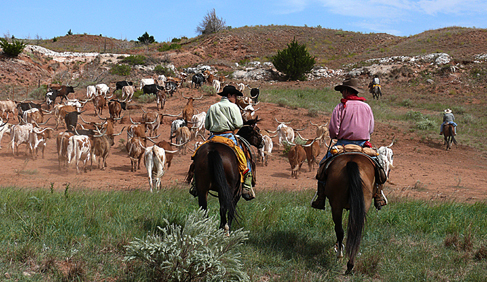 Three day cattle drives are offered in April and October, traveling about 35 miles. On all these drives, camp is set up with a chuckwagon, and cowboy teepees. Sleeping arrangements for the night are in bedrolls either under the stars or in cowboy teepees. Come to the ranch during this time period and take in the Dodge City PRCA Rodeo in the evening. It is an exceptional, professional rodeo. Vacation Cost: $175 per day plus cost of rodeo tickets. Come and live the Moore Rnach lifestyle. On horseback nearly everyday, so get ready for some time in the saddle. Guests may join in on the fun of checking the longhorns from on horseback, doctoring them in the pasture or monitoring wildlife. Three meals and lodging are provided. $175.00 per day. Moore Ranch provides the horses and all the equipment you will need. Lodging and three meals are also included. 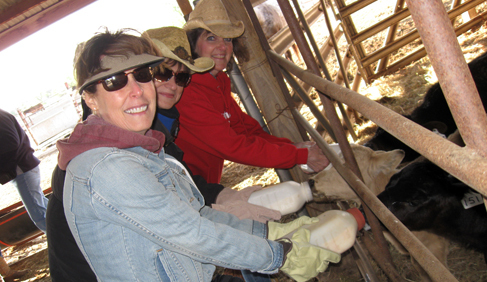 Book this ranch trip or learn more! Email Nancy or call 620-826-3649. Learn more on Moore Ranch's website. Mention Equitrekking. 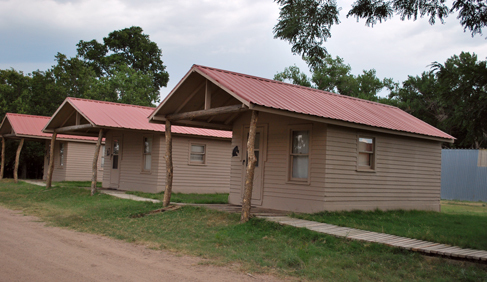 Nicely renovated cabins with a shower, sink and toilet are located in the heart of the ranch, near the barnyard and all the activity. All food is provided at the ranch. Home-cooked meals are served at family dining room table in main house and may include fresh vegetables from the garden, eggs from the hen house, mouth-watering biscuits, and of course, longhorn beef. Any activities dictated by the workings of the ranch for the day. 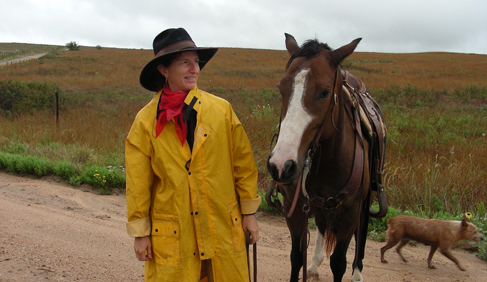 Some may include Longhorn cattle drives, riding over the prairie while monitoring for wildlife, team roping, cattle branding, mending fences and barrel racing. This is not a dude ranch. It's an authentic working ranch. Genuine working ranch where guests experience the true cowboy lifestyle for themselves, just 45 miles from historic Dodge City, Kansas. 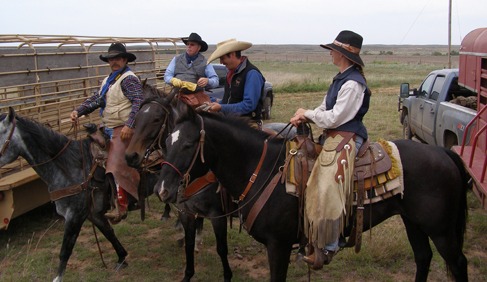 Enjoy cattle drives, learning to rope a calf, barrel race, or even branding longhorns. Western riding. Beginners to Advanced welcome. Two day Cattle Drives $525. Three Day Cattle Drives $825. Learn more about Moore Ranch, including rates and other details.